If you have been following our progress on the development of our Septic Sitter™ system, you may be aware that a demo of the system has been traveling around the USA (in a big orange truck trailer on steroids!) as part of the NXP Smarter World Tour. We have recently been conducting extensive field testing, and are very excited at the data we are now seeing from real life operating onsite sewage systems. We wanted to show an example of how the Septic Sitter remote monitoring system lets you see what is going on underground in the drainfield, even when its buried under 4 feet of snow! 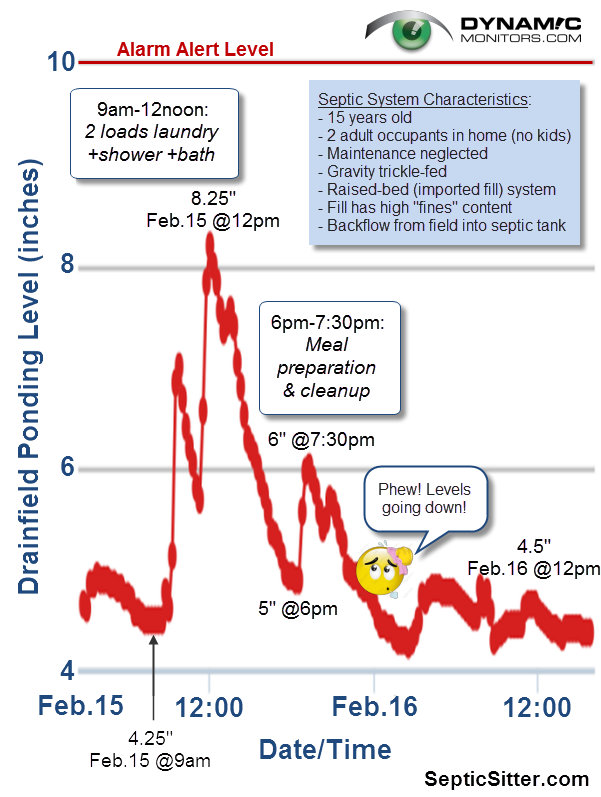 Below is a graph of some recent liquid level data from a real septic system which has a Septic Sitter sensor installed in a (retrofitted) inspection port in the drainfield. We have been monitoring this system fairly regularly since early January. System is for a historic, 4-bedroom home located in Queens County, PE, Canada. Septic system was installed in 2000, so it is about 15 years old. For the past few years, the home has only had two occupants most of the time – empty nesters who work during the day. Imported fill was used to build up the drainfield bed and met the PEI regulations for “Good Quality Fill”. 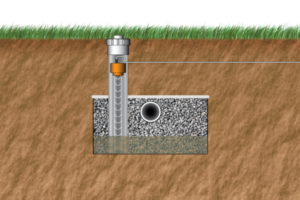 Homeowners do not have a sump pump connected to their septic system. This septic system was designed by my consulting firm 15 years ago. My design standards have changed a lot since then, so I would do some things differently if we were designing a similar system today – the fill that was used for one. For those inquiring minds who want to know, you can find more details on the design, construction and materials used for this septic system, here in this post. My former client agreed to let us use their septic system as a field test site for our Septic Sitter development. They have no immediate plans to sell their house, they were just being nice. Non-contact, ultrasonic sensor is easily installed inside a typical inspection port. The septic tank was pumped in our presence prior to installing the sensor. There was evidence of surcharged conditions and backflow into the tank from the drainfield when it was pumped. The effluent filter was also very clogged. Mr. Homeowner could not recall when the tank was last pumped or when the filter was last cleaned. We retrofitted two inspection ports to the drainfield (we are also developing a cost effective way of doing this). The trench appeared to be ponded several inches deep when we retrofitted the ports. The Septic Sitter sensor was installed in the inspection port as shown in the trench cross section graphic. The Septic Sitter sensor was connected with a direct bury cable to the Septic Sitter Sensor Hub which uploads liquid level and temperature data to the “Cloud” through the homeowner’s Wifi. Below is an image of a screen shot of the liquid level data during the period Feb 15 to 16, 2015. Actual data from 15 year old septic system, Stratford, PEI. I asked the homeowner about the higher than “normal” levels that occurred the morning of Feb. 15. I was quite sure they would have been home as we were in the middle of a major blizzard here in PEI at that time. Mr. Homeowner viewed the data on-line himself, and confirmed that the levels coincided with a couple of loads of laundry plus a bath and a shower between 9am and noon. He and his wife were surprised, and a bit concerned, to see such a large and immediate rise in the levels in response to what they thought was fairly moderate water usage (sewage output). I explained that their drainfield seemed to be in a ponded, condition with the trench probably full to the top of the gravel (4 inches deep) most of the time. It may be backed up all the way to the septic tank much of the time, in which case the tank will offer limited buffering of the flows. I further explained that the septic tank may be full above the normal operating level much of the time. In this case, any significant water usage would result in an almost immediate rise in the levels in the drainfield inspection ports. Mr. Homeowner was surprised and concerned that his system had so little hydraulic capacity to absorb even moderate flows from just him and Mrs. Homeowner. But he was also somewhat relieved to see that the levels dropped back down again once the high water usage events stopped. Seeing this data and getting me to explain what was likely happening prompted him to ask another question. Was there some type of equipment, product or remedial work that could be done to improve the capacity of his drainfield, and perhaps break down the thick biological clogging mat that had likely formed across the bottom of the infiltrative surface? I said that there were many companies who have products or treatment systems to potentially improve the hydraulic capacity of the drainfield, and we discussed a few and the potential costs. But that is a topic for another day and another blog article! So I felt I had to ask him the next question on my mind. Did he regret letting us install a sensor and monitor his system? The Septic Sitter system was providing evidence that his system was under stress, ponded to the point of backing up into the tank. By most industry standards, this system was in a state of failure. If they were not careful, sewage could be backing up into the house next. Before he agreed to get his tank pumped and let us poke holes in his drainfield, Mr. and Mrs. Homeowner were existing in a state of blissful ignorance that their septic system was working just fine. After all, the system had never backed up into their house and they had never seen sewage on the lawn. So for them, no news was good news. To my relief, he replied that while it was disappointing to learn that his system did not appear to be working well despite such light usage, he said it was better to know now, before a backup occurred into their house. He also wanted to be proactive and start looking at what could be done to get the drainfield working better. In the meantime, they are going to try to reduce and spread out their water usage where they can, to try to prevent any dangerously big jumps in the drainfield levels. We and the homeowners are going to continue to monitor this system closely and see what patterns or trends we notice as we transition from the cold, snowy PEI winter and move into the warmer but wet spring weather. It was also interesting to note, that the temperature in the drainfield has always remained at least 1.5 to 3 degrees Celcius above freezing, despite ambient air temperatures dropping as low as -25C for days at a time. We think we have also seen some evidence of infiltration into the system, so we will be looking for that once all the snow starts melting and the spring rains come. See a Live Feed Now! If you want to follow the “ups and downs” of one of the septic systems we are monitoring, including the temperature underground in the inspection port, check out this live feed of another system we are monitoring in PEI which is updated every 15 minutes or less. Levels and temperature data can be displayed in either imperial or metric units. Please note: If the data cuts off or there is a big gap, it means that we have retrieved the unit from the field, likely for a firmware update, as we continue to test new features. We would love to get your feedback and comments below!